In 2003, the National Assembly for Wales made waves worldwide as the first legislature to achieve 50:50 gender balance. Having shown such swift progress on equal representation, the Assembly has enjoyed a reputation as an institution more progressive – and representative – than Westminster. Yet in the years since, we’ve already begun to see the Assembly’s progress rolled back. This year, Electoral Reform Society (ERS) Cymru rang alarm bells ahead of NAfW elections in a report that warned of a ‘stagnating Senedd’. By analysing electoral commission data for every candidate to run for the Assembly over its 17 year history, we will interrogate whether the numbers back up the Senedd’s reputation as an institution that reflects Wales in the 21st century, or if there’s a more serious threat looming to gender-equal representation in Wales. 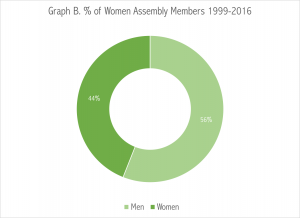 Following a by-election in 2006, female AMs outnumbered their male counterparts in the Senedd for a brief period – neatly reflecting Wales’ demography by women making up 52% of elected representatives. Ten years later, ERS Cymru has identified a high risk to women’s representation in Wales in the run up to 2016’s Senedd race. In a report published in April, ERS raised concerns that 10 of 11 identified ‘battleground constituencies’ were to be defended by female candidates – posing a substantial risk to the gender balance of the Assembly.The same report identified male incumbents defending 21 of the 29 constituency ‘safe seats’. In 2016’s Women in the National Assembly report, Professor Laura Mcallister made the astute observation that a new ‘incumbency overhang’ was slowing the pace of change for gender parity in Wales. 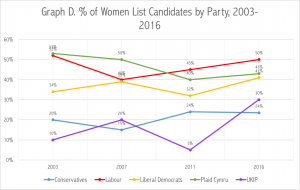 We hope that by plotting out each of the 5 main parties’ gender records for both candidates and elected AMs, we can identify to what extent the Senedd is moving away from its early progress to emulate a Westminster-like model of male-incumbency. 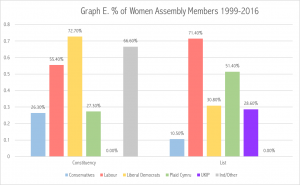 Graph A shows that over the Assembly’s history, male candidates have outnumbered female 2:1. Graph B, however, shows that the ratio improves significantly when we look at elected AMs, moving much closer to an even gender split. In light of this difference we need to take a closer look at individual parties to discern where this corrective effect emerges from – and to assess its sustainability. An analysis of the 5 main parties’ constituency candidates by gender reveals Labour considerably ahead of its competitors in terms of women’s candidacy (indeed running more women candidates than men in 2003 & 2007 races). By contrast the Liberal Democrats flatline around 30% whilst within Plaid and the Conservatives’ men outnumber women 4:1. UKIP takes the wooden spoon, however, having stood 0 women candidates in 2007 – though some consideration must be given to the fact that they didn’t stand in constituency races in 1999 or 2011, reducing their total cohort of candidates. By analysing candidacy at regional list level we can gain a closer understanding of what function proportional representation plays in ‘topping up’ a gender deficit. Graph D shows Plaid make considerable improvements through party lists, whilst Labour are again close to gender parity. The Conservatives and UKIP fare particularly badly again, revealing a more profound lack of female candidates. All parties still fall short of 50:50 – suggesting a ‘pipeline problem’ in the movement of women candidates through party structures to selection. By taking a look at elected Assembly Members, we are able to compare party candidacy across Wales with their ability to secure women’s representation through an effective selection process. At first glance the Lib Dems display seemingly impressive results across constituency races, but in reality this is more of a reflection of their consistent struggle to win constituency seats (they have only ever elected two women AMs, Kirsty Williams and Jenny Randerson). Similarly, Trish Law single-handedly boosts women’s representation in independent candidacies by winning a by-election and re-election in Blaenau Gwent. However, more generally, just 17.5% of Independent and Minor party candidates are women, suggesting that Trish Law’s accomplishments are outliers from the general trend. Labour are, again, the only party to hit and exceed the 50:50 standard, having elected more women through both constituency and list seats. The numbers show that Wales’ progress on gender representation relies heavily on one factor: the enduring success of Welsh Labour. Although other parties have made use of proportional representation at the Assembly to effectively ‘top-up’ on women candidates through regional lists, this is not a sustainable means of ensuring balanced representation. Plaid Cymru demonstrate this pattern most strongly, with a low representation at the constituency level that is counterbalanced by progress on the list. Labour’s achievement too must be cautioned, in that it is reliant on Labour continuing to return a steady number of AMs, despite facing a 7.6% drop in constituency vote share in 2016. Although their continued dominance of the Assembly has enabled the party to enjoy a greater candidate pool and a greater selection of seats to elect women, ERS Cymru’s 2016 report reveals the fragility of even Labour’s progress. If the trend of Labour’s ‘safe’ seats returning male candidates continues in tandem with women incumbents defending battleground constituencies, Labour too may see their progressed dashed by a creeping ‘incumbency overhang.’ The continued dominance of male candidates through every other party – through both constituency and list candidacy – reveals a fragile picture behind the women with a seat in the Senedd. For Wales to ensure it maintains progress on gender parity – and its reputation as a more representative body than Westminster – it will require every major party to correct for gender imbalance where it exists. Whether this be through through all-women shortlists, twinned constituencies, zipping or another proven method, it’s clear that without a gear-shift women’s representation in the Senedd will be increasingly fragile. Thanks for the comment Dafydd. We accept your point that the blog doesn’t discuss positive changes that have been made in recent elections with regards to the gender balance of AMs for each party. We are planning a further blog that will actually look at how competitive constituency seats are in places where women are challenging or incumbents, as well as their positioning on party lists that will hopefully illuminate some of the points you raised. However, we feel that the central point of the article – that parties need to take action on this issue – stands. 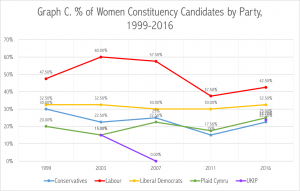 At the constituency level, Plaid have never fought a NAfW election where more than 25% of its candidates have been women, and the proportion of women candidates on the list has actually been in decline since 2003. 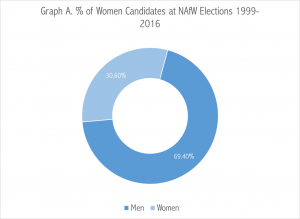 Of course, this isn’t to say that progress hasn’t been made in other areas, but in terms of overall proportion of women candidates, this has been limited. Again we appreciate the comment and hope to provide more insight on the points you raised in the future. This is a good summary with some useful graphs and tables, Jac and Rachel. I have long argued the same, ie reliance on Labour dominance electorally (maintenance of respectable gender figures were ‘saved by the bell’ in both 2011 and 2016) and the stability of candidate selection/reselection (much of which depends on ‘incumbency overhang’ as we highlighted in the ERS report). It’s not as straightforward as a supply and demand pipe line issue might suggest either as women are more likely to be selected to fight marginals or be placed on a list in a vulnerable second or third position. My conceptual analysis is of this focuses on the remarkable lack of real cultural buy in as to the real electoral and political value of diversity in any of the main parties. Labour fares best in this regard (and can be attributed to critical mass, the politics of presence and the fact that most of its initial AMs were equality champions and feminists). The other parties range from ‘imitators’ to ‘laggards’ in truth, and there remains a lack of real drive and leadership around this important issue in my opinion.